Kaʻula Island lies about 23-miles west-southwest of the south end of Niʻihau. Geographically and biologically, Kaʻula could be considered to be part of the Northwest Hawaiian Islands. However, it is the westernmost of the Main Hawaiian Islands and is not included in the Northwestern Hawaiian Island section – it is part of Kauaʻi County. 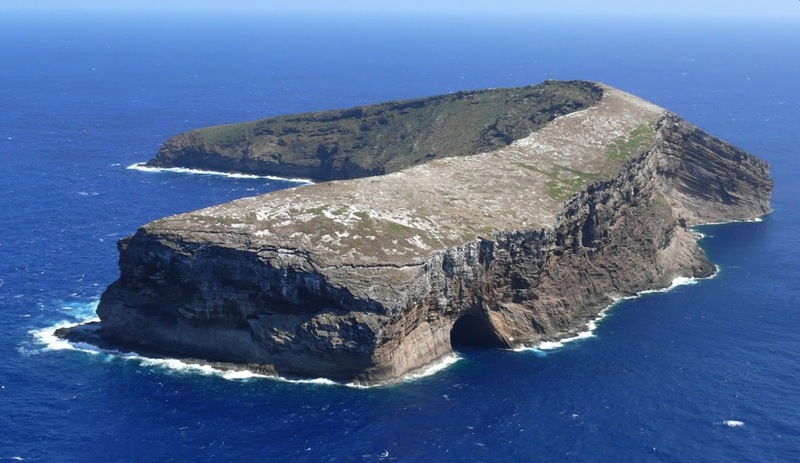 It is Hawaiʻi’s second largest offshore islet (after Lehua,) making it the tenth largest island in the Main Hawaiian Island chain. Due to its size, a lot of people call it Kaʻula Rock. Kaʻula was one of the first five islands sighted by Captain James Cook in 1778, which he referred to as “Tahoora”. Around 100,000-seabirds of 18-different species nest on Kaʻula, with many sooty terns, brown noddies, boobies and wedge-tailed shearwaters. Kaʻula has no beaches for landing; there are steep cliffs on all sides of the island. A large sea cave is located at the northwestern end of the island. As early as 1921, the Light House board decided that a navigational light was needed on Kaʻula. On December 13, 1924, per Governor’s Executive Order 173, Kaʻula was set aside for the US Lighthouse Reservation for a Lighthouse Station to be under the management and control of the Department of Commerce. The US Lighthouse Service operated the automatic gas light near the summit of Kaʻula from 1932-1947. Following World War II, US Coast Guard used Kaʻula as a radar navigation target. The US Coast Guard, successor to the Lighthouse Service, later granted a revocable permit to the Navy (September 9, 1952) to use 10-acres on the southeastern tip of the island as a live fire air-to-surface and surface-to-surface practice range; the Coast Guard later (1965) transferred the Island to the Navy. In 1978, the State of Hawaiʻi contemplated the inclusion of Kaʻula Island into a State Seabird Sanctuary and an Attorney General memorandum took the position that the Island belonged to the State. In part, it noted that since it was no longer being used for lighthouse purposes, the set aside in Governor’s Executive Order Number 173 should be canceled by appropriate documentation. Permission from the US Navy is required to be on or around the island. The matter of ownership appears to be still in question, with the Feds and State disagreeing on who owns the island. The image shows Kaʻula Island. In addition, I have added other images in a folder of like name in the Photos section on my Facebook and Google+ pages.